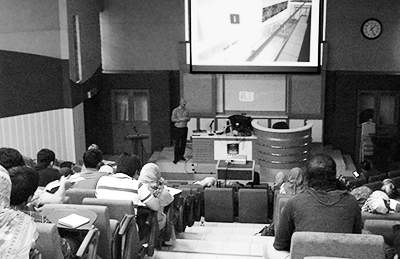 Howard Griffin, Programme Director of the MA Architectural Visualisation, travelled to Penang, Malaysia to present his work on Virtual Heritage to members of the Georgetown Heritage Inc. and staff and students of the Universiti Sains Malaysia. The presentation looked at different aspects of digital integration in heritage work, including 3D site scanning, 3D animation and the use of CGI in the film industry. The presentation also highlighted the work of the MA Architectural Visualisation students and English Heritage to ‘re-create’ St. Augustine’s Abbey and monastery in Canterbury using games engine technology. The use of games technology to recreate historic buildings is seen as a key component in the dissemination of heritage knowledge. Howard Griffin explained that the opportunity, “…for people to not merely view the past, but participate in it, is an important development. We have seen this with games, such as Assassin’s Creed, in which the player is able to navigate the streets of ancient cities.” Howard also went on to present the work to the students and staff at the Fakulti Senibina Perancangan & Ukur (Faculty of Architecture, Planning & Surveying), Universiti Teknologi Mara (UiTM) in Kuala Lumpur. The initial phase of the St. Augustine’s Abbey project is due to be completed in May, when a second phase of evaluation and feedback on the immersive effects of the game will begin. It is hoped that further collaborations on Virtual Heritage will be possible in the future.